WILLEMSTAD - A $43 million megaship-ready pier will be done in time for the 2017-2018 cruise season in Curacao, boosting capacity for the island. “Our goal is to have 1 million passengers; and we need the additional capacity. 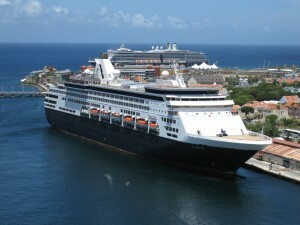 This will enable us to further grow the business,” said Raul Manotas, chief commercial officer at Curacao Ports Authority, in an interview with Cruise Industry News. He attributed the growth course to the uniqueness of the destination and its shoreside product. The 2016-2017 season was expected to come in at just over 600,000 passengers. There are already megaship bookings for the new pier, and that will allow the country to open up Willemstad to luxury and niche ships, according to Manotas. The summer will be active too, as Curacao, working with a number of other ports, convinced Pullmantur to stay for the summer and up company capacity again in 2018. Incentive programs include volume-based discount and summer call incentives. Going forward, expect a program to let ships overnighting keep casinos and shops open. More collaboration across the region with Curacao, Aruba, the Dominican Republic and Cartagena promote a so-called Caribbean fusion itinerary. “The Caribbean is sun, sea and sand, and you can offer a lot with these destinations, and a piece of Europe via Curacao,” added Sem Ayoubi, shipping development manager. Homeporting by European cruise lines is another focus area.